- The Group had cleared the symbolic threshold of €1 billion in revenue in 2015. Eighteen months onward, with year to date2017 revenue amounting to €977 million, it nearly reached this threshold in just nine months. This acceleration illustrates the Group’s strong growth momentum, which should allow Akka to generate revenues of more than €1.3 billion over 2017 as a whole. - The momentum is consistent throughout the business units. Economic growth** was 7.6% for the period from January to September compared to the first nine months of 2016, with +8.4% in France, +6.1% in Germany and +8.2% internationally. - Third-quarter revenue amounts to €310.3 million, an increase of 13.7% YoY. Economic growth stands at 5.4%. It was particularly robust in the French (+7.6%) and International (+8.6%) business units. In Germany, growth was temporarily dampened due to a challenging comparative basis and the impact of streamlining loss-making legacy businesses. France continued its excellent momentum in the third quarter. Its revenue amounted to €403.3 million over the first nine months, with economic growth of 8.4%. The third quarter saw economic growth of 7.6%. French operations benefited from growth in the automotive, aerospace, rail and life sciences sectors. As in previous quarters, AKKA France gained market share thanks to its strategic positioning in mobility, digital technology and embedded computing. Furthermore, half of the hires of the third quarter were made in those areas. The sustained recruitment momentum holds out the prospect of further strong growth in the fourth quarter. 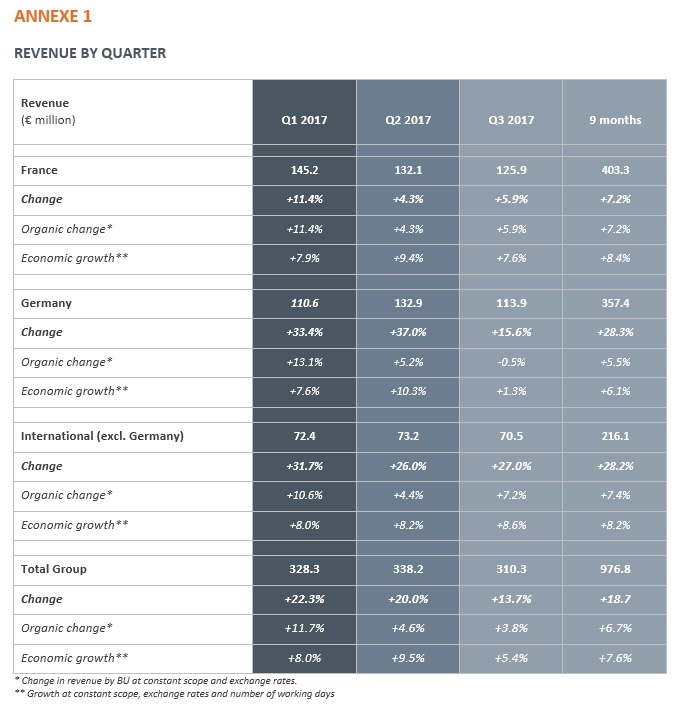 In Germany, revenue increased by 28.3% to €357.4 million over the first nine months. Economic growth was 6.1% over the period. Third-quarter revenue amounted to €113.9 million, a total increase of 15.6%. Economic growth of 1.3% reflected the challenging comparative basis (organic growth of 11.7% in Q3 2016), the streamlining of certain loss-making legacy businesses, the closure of which was announced when the interim results were released, as well as the consolidation of GIGATRONIK. GIGATRONIK’s activities are being deployed regionally and merged into AKKA Germany’s digital activities. This allowed the Group to win its first significant contract in the field of Advanced Driver Assistance Systems for one of its key German customers. The Group’s International operations (excluding Germany) posted revenue of €216.1 million over the first nine months, an increase of 28.2%, with economic growth of 8.2%. They recorded economic growth of 8.6% in the third quarter, a slightly faster pace than in the first half (+8.0%). Akka believes that its Oil & Gas activities have bottomed out in Q3. Organic growth, excluding Oil & Gas, reached 14.4% over the quarter. Growth in the quarter was predominantly driven by Asia, the Czech Republic, Italy, the Middle East and North America. - At the end of October, the Group placed a €450 million Schuldschein bond (private placement governed by German law). Strong demand among investors reflected their confidence in the Group’s strategy, its European identity based on its Franco-German pillar, its international dimension and its medium- and long-term potential. - The Schuldschein bond has several tranches, maturing in five, seven and ten years respectively, with an average interest rate of approximately 1.5% per annum. The bond, which is non-dilutive for shareholders and does not affect the Group’s net borrowings, reinforces its financial flexibility and diversifies its sources of funding. It also strengthens the Group’s financial structure by extending the average maturity of its debt, and reducing its average borrowing costs. - The funds raised will, in part, enable the Group to reduce the cost of its debt by reimbursing existing facilities. The balance will give the Group the means to roll out its new strategic plan, CLEAR 2022. - Fourth quarter performance is expected to be in line with the previous quarter. This should enable the Group to post full-year revenue and operating income in line with expectations, and slightly above its objectives, which had been raised in July. - The successful completion of the transformation in France, the diversification in Germany and the maintenance of high margins internationally will enable the Group to exceed its 2018 revenue targets and deliver an operating margin from ordinary activities*** of between 8% and 10%. - Following the success of its previous PACT 17 strategic plan, and with its unique positioning to support its clients meet the challenges of Industry 4.0, the Group plans to communicate its new CLEAR 2022 strategic plan at the end of January 2018. The new plan is geared towards strengthening AKKA France’s leadership, consolidating AKKA Germany’s positioning and accelerating the Group’s growth internationally.